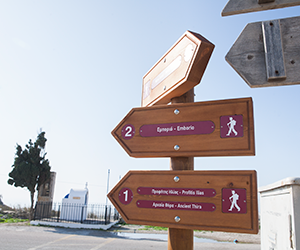 The Santowalks is a unique walking program especially designed to lead you through the very old in existence but recently signed hiking routes of Santorini. 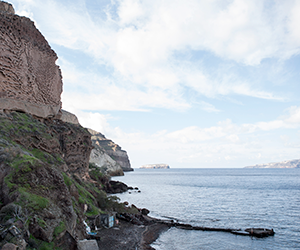 You will enjoy different walks along and down the caldera cliff, the historic vineyard of the island, the untouched by mass tourism villages of Santorini, the hidden beaches of the caldera and you will observe the abrupt change in colours and consistency of the volcanic products. With our experienced guide and in small groups of trail lovers you willenjoy our challenging program that will allow both experienced and also amateur hikers feel what this volcanic land whispers to them during this tranquil, off-season period. Heliotopos Hotel, in Imerovigli, will host you during your stay in Santorini and will be also your kick-off point daily, after a rich in energy breakfast. Enjoying local food and wine, along with meeting the locals will be extra tips for your lifetime Santorini experience. The Santowalks is a three-day program planned for every Wednesday to Saturday until the 30th of April, 2015. Customized tours are also available upon request. Contact us to receive a tailor made proposal at marl@heliotopos.net! The program includes three nights stay at Heliotopos Hotel, Imerovigli where we will also be meeting to discuss the schedule and the experiences of the day. Heliotopos is a unique boutique hotel complex of traditional dome style, with one or two storey suites and studio apartments. Built on the foundations of old island structures it has been constructed to reflect the beauty of Santorini’s architecture. Located at the highest point of the crater-top (the rim of the Caldera) it offers an extraordinary, breathtaking view of the volcano, the sea and the surrounding islets from every point of the hotel. Bookings will be handled in a first come first served basis. In case of no availability, any extra participants will be accommodated in nearby hotels. You look forward to join us for the SANTOWALKS? Sure you do! 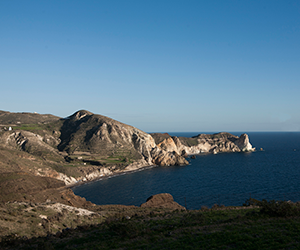 Check bellow your options for getting to the island during this period. Santorini can be reached from most international airports via Athens. The flying time from Athens to Santorini is approximately 40 minutes. Nearly all international scheduled flights arriving in Athens allow adequate time for making the connecting flight to Santorini. Another way to reach the island is by a regular ferry boat service from the port of Piraeus. The boat trip takes approximately 8 – 9 hours depending on the ports of call. 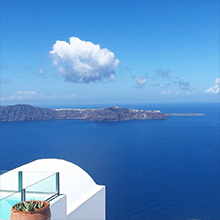 Heliotopos Ltd is a destination management company and a professional conference organizer that specializes in meetings, incentives and events as well as in the organization of special interest tours, cultural and culinary holidays, etc in Santorini.